Living in California, it was not easy for me to pack for a two-week trip to Germany in December as I don't have true winter clothes. I planned quite a bit and am happy to say that everything worked out quite well. I tried on most of the outfits before I packed to make sure everything worked out the way I had envisioned it. I had learned a hard lesson during our summer vacation when I hadn't tried on anything and just put together outfits in my head and then nothing worked out the way I wanted it to. I bought a plain, grey jacket and decided to liven it up a bit with a colorful scarf, hat, and gloves. The gloves, hat and scarf were my favorite purchase in preparation for the trip. Here are a few of my favorite views of my hometown - Würzburg. Würzburg is the starting point of the Romantic Road and is therefore quite the tourist destination. Since it was Christmas time, we had fun visiting the Christmas Market a few times. When I'm "home," I always have to do a little shopping as I love to wear clothes and accessories that I buy on trips. Wearing them always transports me back to the trip. I plan on wearing the heart sweater on Valentine's Day. Questions: What are your tips for packing for vacation? Do you like to buy clothes and accessories when you are on vacation? Thanks, sweet Andrea! Hope you had a great weekend and that you'll have a wonderful Valentine's Day! I totally do that now---try on my outfits before I go. It makes me realize that some things go better together than others, and i have less issues then!! Thanks for sharing such wonderful photos, Andrea!! I'm assuming you made some purchases at the Desigual outlet?? I always love that designer!! Trying everything on and taking photos is really helpful! I learned my lesson the hard way in the summer. Great post. I remember visiting Wurzburg a few years ago. I rarely buy clothes now when I'm on holiday. I've got too used to buying online! Christmas markets in Germany are the best!I love that scarf, gloves set, fun colors! Thanks, Nancy! It was the first time that Andy was in Germany in December, and he couldn't get enough of the Christmas markets... :-) I'm so happy I bought the scarf, hat and gloves; they make me happy. Thanks, Patti! Have a great week! Great outfits! I love your colorful scarf set. So pretty! I do the same when I can. Try out different formulas of an outfit. But I have also been on the other side of spectrum and just packed. So I try to plan ahead but we all know how that goes at times, right? If this happens and I am short of planning, I just make sure to pack my go to's with one or two other newer items to mix in. That way I know I won't be stressed about not liking my outfits. Yes, taking go-to pieces is definitely smart! 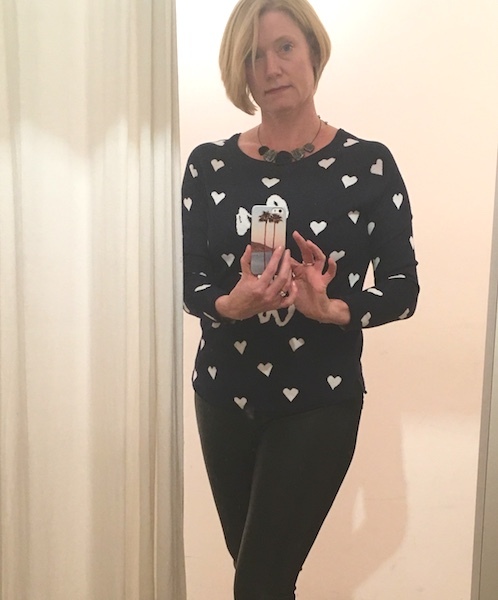 LOVE that heart sweater!! it's adorable!! I really want to go to Germany - fun fact: I was born there!!! I didn't know you were born in Germany! You should definitely go! Loving the bold colorful stripes and gorgeous pics from Germany! Ahh, two weeks in Germany sounds lovely! That is somewhere I'd love to go eventually. I love those leather leggings you paired with a bunch of the tops. That colorful striped scarf, hat and mitten set is so cheery! YAY, you are back! And what a great post. So many looks to love. You are looking especially svelte! Are you doing barre still? As soon as this foot is healed, I have a friend who will try barre with me!!! Yay. Welcome back, have missed your mug!! Glad you are back! Love the pants and sleek looks. i also love that you bought the rainbow of winter accessories! It helps to have more color in the winter to brighten our days!